Episode 3 of the Walking Dead only takes place about a week from the intense Episode 2, and features more tough decisions that you'll have to make on a very short time limit. The group has been able to fix the RV, and events begin to set in motion that find them thankful that they repaired it. The overall flow of the game hasn't changed too much, which is good thing since what Telltale established in Episode 1 has been really great to experience. In this episode, you'll actually find yourself in some roles that really pick up the game's story and action, which still requires you to be on your toes at all times. Later in the episode you'll have to put your thinking cap on more, as some environmental puzzles task you to remember some small details that the game lays out. Emotions will run high in this episode, but there are some funny moments that temporarily ease the pain of making very difficult decisions. It was always hard to make a decision and then watch as the game saves, making you really stick with what you did as you move on, but it's also one of the best features of the game. Without the ability to revert a save or checkpoint, all of the choices become much more impacting. The visuals are still great, although there were some technical issues I ran into involving the recap video showcasing some of the choices I made in the previous episode. Most of the episode take place outside and you'll also venture to new locations which is pretty refreshing from the farm from episode 2. Episode 3 took me about 3 hours to complete and most of the time was spent in the later parts of the game as I slowly figured out what to do next. $5 is still a great price for these parts, and each one usually warrants about two playthroughs, and once they're all released it'll be cool to sit and playthrough them all in one go. 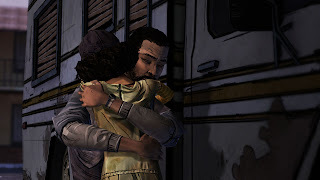 Long Road Ahead is business as usual for the Walking Dead game and leaves you wanting more, which is something that I said for Episode 2 as well. 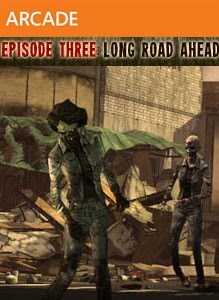 It's nice that there will be more episodes of the game after Ep.5 comes out, because I can't get enough of these games!